Booking period: Until September 3, 2011 or until tickets run out (whichever comes first). Booking Details Book your tickets at www.cebupacificair.com or their ticketing office. 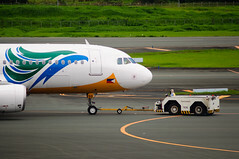 Travel period is December 1, 2011 to January 31, 2012. Promo fares are available until August 30 or until they last (whichever comes first). Travel period is October 1 to December 31, 2011. 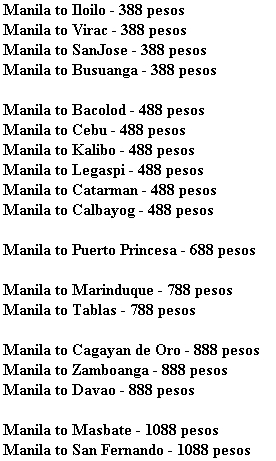 Promo fares are available until August 28 or until they last (whichever comes first). 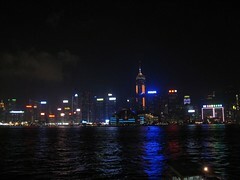 Travel period is from October 1 to December 20, 2011. Booking period is until August 29, 2011 or until tickets last. Promo fares are available until August 29 or until they last (whichever comes first). Book your tickets at http://book.jetstar.com/. Travel period is from August 25 to October 15, 2011. Booking is until August 25, 2011 or until promo tickets last (whichever comes first). Travel period : November 1 to December 30, 2011. Booking period : August 23-24, 2011 or until tickets last. 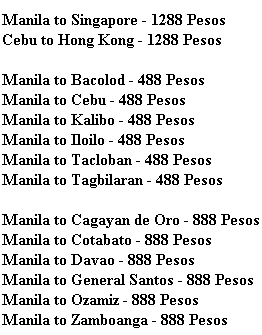 Promo fares are available until August 25 or until they last (whichever comes first). Travel period is from August 12 to October 15, 2011. Booking is until August 23, 2011 or until promo tickets last (whichever comes first). Travel period is from September 1 to November 30, 2011. Booking period is until August 22, 2011 or until tickets last. Travel period is January 1 to March 14, 2011. Promo fares are available until August 21 or until they last (whichever comes first). Booking period is until August 20, 2011 or until tickets last. 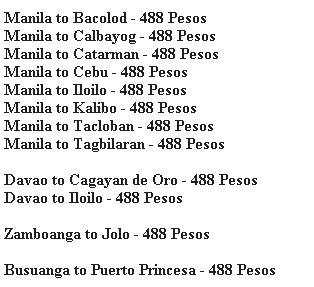 NEW PISO FARE SEAT SALE PROMO FROM CEBU PACIFIC! Travel period is October 1 to December 14, 2011. Promo fares are available until August 20 or until they last (whichever comes first).